On Sunday mornings from 9:30-10:30 a.m. and 11:00 a.m.-12:00 p.m., there are 16 Bible Study classes available for adults of all ages. Highland does not have age-graded classes for adults, so adults are encouraged to visit any and all of these classes to find the best fit for their learning style and comfort level. Classes use either Smith and Helwys Formations literature or a lectionary based curriculum called Feasting on the Word. There are also a few classes that are topical. Childcare, children’s Bible Study, and youth Bible Study are provided during these meeting times. At Highland, we believe learning together is an important part of Christian growth. That is why we set aside an hour every Sunday for the entire church to grow through Bible study. We have classes for senior adults, for new members, and for persons interested in social justice. In short, there are classes for almost everyone! Below you will find our Bible Study schedule, some basic facts about each class, and each class’s approach to the material. It is impossible to capture the flavor of a class in a single paragraph, but perhaps this information will help you to find a place to begin exploring. And that is exactly what we hope you will do: explore. Learning about God is an exciting journey. Our goal at Highland is to be co-learners with you as we all journey together. Look around, find a class that fits where you are right now in your journey, and jump on board. Become part of this thinking, feeling, healing community of faith. Fireside Room. Teachers: Bojangles Blanchard, Billy Flood. This lectionary-based class fosters dialogue and builds community by emphasizing a radical welcome to all people, especially those who are traditionally marginalized or wrongly categorized by society, as well as those who seek to be authentic allies in the quest for inclusive justice. Large group discussion invites participants into friendships that offer prayer, safe space, and ongoing support throughout the week. Lower Level, Room 8. Teacher: Steve Brown. This class is for adults who have an interest in an intensive and academic style of biblical exploration. The class has spirited group discussions and shares prayer concerns each week. The curriculum varies and is composed of Bible study and book study. Lower Level, Room 9. Teacher: Roy Fuller. This class is for married and single, ranging from 50’s-70’s. The lesson is taught through lecture and thoughtful class discussion. Prayer concerns are shared each week. Lower Level, Rooms 11-12. Teacher: Chip Miller. This class is multi-generational, ages 50’s-70’s. The lesson format includes scriptural reflection and group discussion with an emphasis on life application. Each week, prayer concerns are shared during the class. Pastoral care is extended to members of the class throughout the week. Activities, cards, calls and emails keep members connected beyond Sundays . Room 122. Teacher: Guthrie Graves-Fitzsimmons. The class notices how the Biblical narrative features normal people wrestling with big questions in their own times and lives. In turn, class members springboard into conversation about the big questions in our time and lives. Think this: ancient story bumping into contemporary pop-culture in the form of politics, music, film, book, social media, and theater. Lower Level, Room 1-2. Teachers: Robert Davis, Doris Hornbuckle. This inter-generational class is composed of singles and couples in their 30’s -70’s. 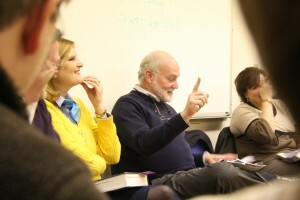 The class engages lively discussions around Scripture and application for life. The class values an extended commitment to prayer concerns, local mission projects, and social activities. Lower Level, Rooms 5-6. Teacher: Tom Solley. This class, composed mostly of couples with elementary and middle school aged children, enjoys guided group discussion around the biblical text, Beginning with the historical context, talk then moves toward present day relevance as parents and family busyness. Support comes through praise and prayer concerns, social gatherings, and a weekly e-newsletter. Lower Level, Room 10. Teachers: Tracy Holladay, Patty Martin Nichols. This class includes couples and singles, 40-60 years of age and utilizes lecture and class participation. Weekly prayer concerns give opportunity for members to share vulnerability and mutual support as life ebbs and flows. 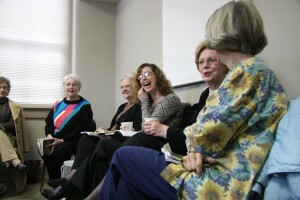 A weekly e-newsletter and fellowship keep the group connected. Lower Level, Room 7. Teacher: Nathan Marrs. This class offers married and single adults, mid 30’s to 40’s, with or without children, space to discuss everything from existential questions about God to the nitty-gritty practicalities of life’s. Members keep in touch through weekly emails about prayer concerns, social gatherings, and pastoral care. Lower Level, Room 3. Teacher: Karen Womack. This intergenerational women’s class explores the biblical text of the day through discussion and life application. Prayer concerns give shape to the class structure, while pastoral care and class fellowship activities further form a significant part of the class. Bible Study 2, 11:00 a.m. – 12:00 p.m.
Room 103. Teacher: Marilyn Sanders. This class is for individuals aged 60+. Mixed lecture and discussion around the text for the day. The class shares prayer concerns and offers care for those who are absent or ill. Youth Commons, 2nd floor. Teacher: Jim England. This inter-generational class invites people to deepen their faith through Bible study, discussion and real-world living. 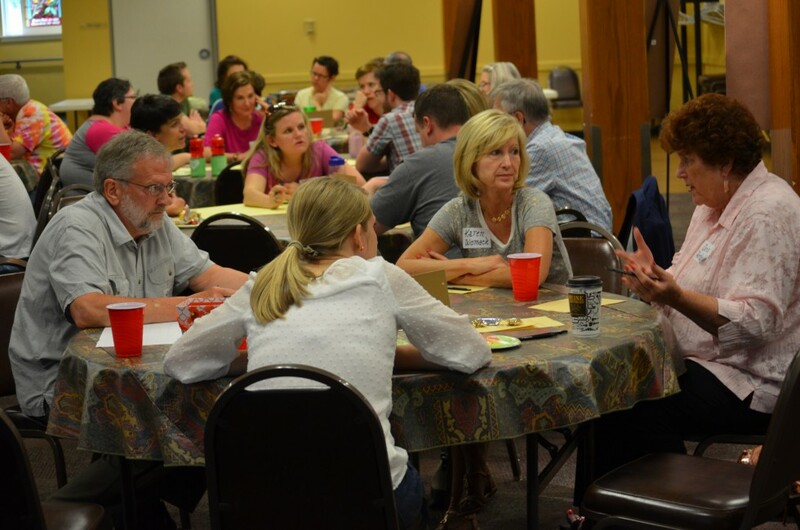 Sharing prayer concerns is part of the class, and outside gatherings for fellowship. Youth Commons, 2nd floor. Teachers: Hollan Holm, Kate Dittmeier Holm. This class is for parents interested in social justice. In addition to weekly Bible study, monthly activities include family participation in a social justice-related activity and family play dates/ get-togethers. Youth Commons, 2nd floor. Teachers: Mary Burks, Bob Cunningham, Walter McWhorter. This inter-generational class includes couples and singles. The lectionary text of the day forms the basis for spirit-led exploration and heart-felt conversation. Prayer concerns and joys of life are always included. Youth Commons, 2nd floor. Teachers: Justin Boldt, Jill Ligon Davis, and others in the group. This class welcomes people from a variety of backgrounds and experiences, and consists primarily of those in their late 20s-30s. Focused on Scripture and other spiritual texts, this class offers personal reflection, contemplation, and a pause from life’s busyness. This is an intentional, community-building group that welcomes silence and small/large group discussion. They also enjoy off-site brunch the first Sunday of each month. Click here to see the Bible Study Guide that includes a map indicating the location of each class. For information about Bible Study for children, youth, or young adults, see each ministry area’s page. If you are interested in learning more about Adult Bible Study, contact Carol Harston.